Metallographic cross-sectioning is the technique, during material characterization or failure mode analysis, for exposing an internal plane of interest in an object or IC package examination. Physically destructive to product, cross sectioning of ICs requires encapsulation of the specimen in plastic to provide support, stability, and protection. 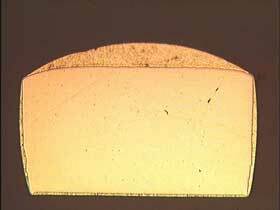 Also known as micro-sectioning, IC cross sectioning begins with the preparation of the sample. This sample preparation step is usually followed by the mounting, sawing, grinding, polishing, and staining of the specimen. At the completion of these processes, the plane of interest has been made ready for optical microscopy and/or scanning electron microscopy. Silicon Cert Laboratories has experience with metallographic cross sectioning; contact our engineering staff for information today.